We are greatly pleased to invite you to join our event organized by the EU FP7 project iLOAD - Open Architecture Control Systems Summer School. The event will take place in Miedzyzdroje, Poland between 29.08.2014 and 02.09.2014, just before the 19th International Methods and Models in Automation and Robotics MMAR 2014 conference and will be devoted to Open Architecture Control Systems in Mobile Automation. The main goal of the OACS Summer School is to provide a substantial training opportunities for PhD students as well as postdocs, giving each of them a highly valuable perspective of scientific work and knowledge sharing. We would like to host all young researchers who are interested in control system issues and want to extend and share their knowledge and ideas. 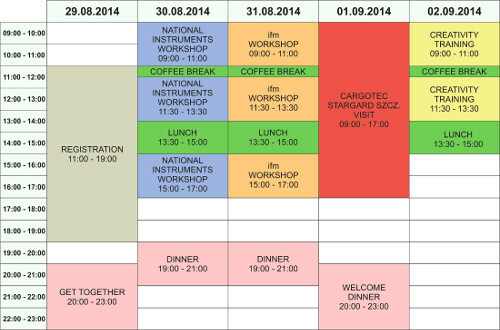 During the OACS Summer School there will be a possibility to get familiar with latest trends in control systems thanks to the workshops leaded by experienced engineers on a highly advanced equipment (National Instruments LabVIEW-driven digital signal processing) and develop skills connected with distributed control systems in mobile automation. All attendees will obtain a proper Certificate of Participation. During this unique event there will be also provided a creativity training for gaining interpersonal skills. A demonstration trip to newly opened HIAB - Cargotec factory in Stargard Szczeciński will be an extra event prepared for participants of the OACS Summer School. It would be a great opportunity to meet new people from all around the world, extend personal skills, get familiar with the newest automatic solutions and also spend great time by the beautiful polish Baltic Sea at the end of the summer. We are waiting for your submissions. See you on EU FP7 project iLOAD - OACS Summer School! Organizing committee with the participation of EU funding will cover all expenses related with conducting the OACS Summer School events and trainings. Please take into consideration that the OACS Summer School has limited number of training places.